Sometime in late 1943 or early 1944, a number of 617 Squadron aircrew flew up to the Avro works near Manchester. A historic picture taken in the boardroom has recently come to light. All of the 617 Squadron personnel were in Mick Martin and Joe McCarthy’s Dams Raid crews. They have been identified by Alex Bateman in a post on the RAF Commands forum. Only some of the Avro staff have been identified, including the fitter, Mr Hickson, whose son inherited the photograph. It looks as though the fitters involved were not given much notice as they all appear to be in their working clothes. 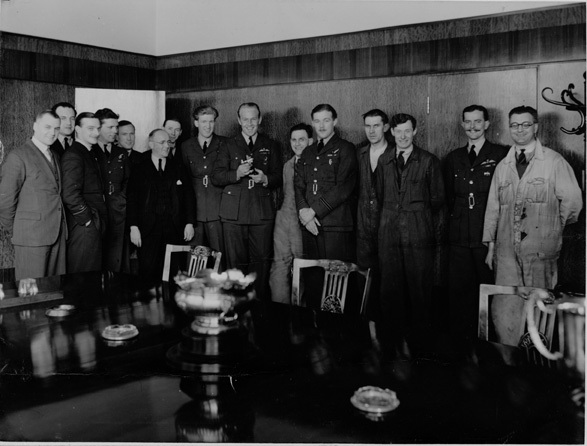 Left to right: John Fielding (Avro research manager), Tammy Simpson, Toby Foxlee, Don MacLean, Dave Rodger, Teddy Fielding (Avro production director), (unknown Avro worker), Bill Radcliffe, Joe McCarthy, Mr Hickson (Avro fitter), Ivan Whittaker, (unknown Avro worker), (unknown Avro worker), Mick Martin and (unknown Avro worker). The two Fieldings at Avro were unrelated. Please get in touch if you can identify any of the unknown Avro personnel. Trying to find any information on Ken Carline navigator.